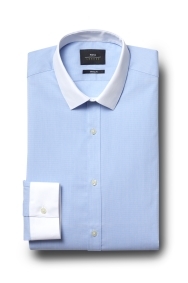 Choose this Moss London shirt when you want to keep your style simple. 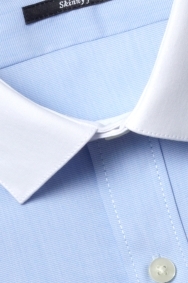 In a sky blue shade with sharp contrast from the white cuffs and cutaway collar, it’s an up-to-date alternative to a plain shirt. Made with stretch material and cut in an extra-close skinny fit, it will define your frame while still letting you move. Team with dark wash jeans and brown brogues to give your weekend wardrobe a stylish update. Very well designed and of great quality material.